MBABANE , Mar 25 2013 (IPS) - Every day for the last four years, 52-year-old Tintfombi Msibi has had to walk past the borehole in her village of Ekuphakameni, one of the driest rural villages in southern Swaziland, to a dirty stream two kilometres away to collect drinking water. “We’ve been struggling to get water in this community because the borehole the government installed for us broke down,” she told IPS. The borehole was supplied to the community through the government Umtfombo Wekuphila Water Scheme on the condition that the beneficiaries of the project set up a fund for its maintenance. However, Msibi said some community members were too poor to contribute the monthly payment of about 1.60 dollars. “Most people are poor here, so they could not afford to pay,” she said. In the end, because of the lack of maintenance, the borehole eventually broke down and the cost of repairs would have required each household to raise 10 times the amount they would have originally contributed. In a country where 63 percent of people live below the poverty line of two dollars a day, 17 dollars is considered a huge sum. But Msibi’s community is not the only one struggling with access to water. While Swaziland’s Rural Water department claims that 69 percent of the population has access to clean water, the Water Project, an NGO that helps African countries access safe water, says that some 90 percent of community water projects in this southern African nation are not working. Obed Ngwenya, the director of the Rural Water department, under the Ministry of Natural Resources and Energy, confirmed that his department also estimated that 90 percent of community water projects were not working. He said, however, that he would only be able to supply concrete figures once an assessment of all the dysfunctional schemes was concluded. “Over 90 percent of the rural water schemes use boreholes, which is where we have the biggest challenge because they break down and accumulate huge electricity bills,” Ngwenya told IPS. Ten percent of the projects are protected springs, which are much easier to manage, Ngwenya added. He explained that normally when a borehole broke down, a development partner would usually build another one. “The one that is broken down is not fixed but left to lie idle,” said Ngwenya. This has created a lot of “white elephant” water schemes throughout the country, he said. The Ekuphakameni village is part of the Matsanjeni constituency, which has 175 boreholes, constituency headman Seth Gumbi told IPS. He said that of these, 75 were not working and the remaining 100 were not sufficient to supply the population of 17,000. Many people are forced, like Msibi, to travel significant distances to fetch water. Some boreholes use hand-operated pumps that break down easily, said Gumbi. He added that others broke down because the high concentration of salt in the water corroded the mechanism. But Trevor Shongwe, the acting director of the Rural Water department, assured IPS that in a few months time the borehole in Ekuphakameni would be repaired and Msibi would just have to step into her village to get clean, safe drinking water. “We’re currently mapping out all the rural water schemes in the country to get a sense of how many are functioning and (how many are) not,” said Shongwe. He said that five out of the country’s 55 constituencies had already been investigated. Shongwe added that the government had teamed up with partners, including NGOs and the private sector, to repair the water projects that have broken down. 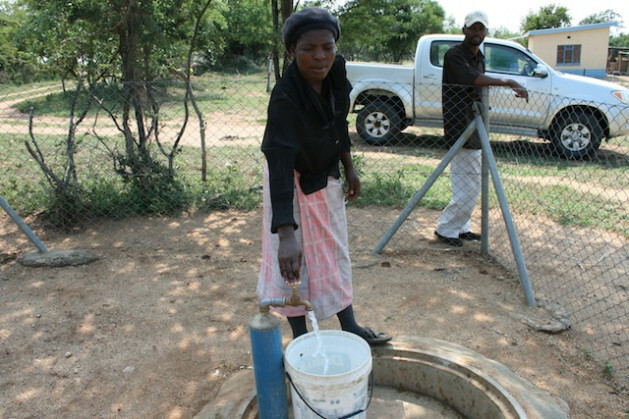 According to Water Sanitation and Hygiene (WASH) Forum chairperson Jameson Mkhonta, most of the government water schemes here have collapsed because of mismanagement. And others stopped working because communities could not afford the escalating electricity costs of pumping the water. “As part of the rehabilitation exercise, we’ll also sensitise communities to mobilise resources to settle their electricity bills,” Mkhonta told IPS. The communities will also be trained on how to run the projects efficiently. In order to avoid leaving communities with huge electricity bills, the Rural Water department has been encouraging them to use gravity to pump water, where possible. Nsuka, a community that is about an hour’s drive from the commercial capital of Manzini, is doing just this. Funded by World Vision Swaziland (WVS), this project involves the construction of a 120,000-litre tank that will hold water drawn from a nearby spring. “The spring is sitting at the top of the hill, which makes it easy to pump the water through gravity,” Daniel Maduna, WVS water and sanitation programme manager, told IPS. The project will supply water to 221 households of about 10 people each from June, Maduna said. While the cost of running the scheme will be low, Nsuka residents will have to contribute money towards the maintenance of the water pipes. So far, they have collected about 66 dollars for the establishment of the maintenance fund. Maduna said this project was based on the Ministry of Natural Resources and Energy model for providing water for rural communities, and communal taps would be installed within a 200-metre radius of each household. “Each person is entitled to 30 litres of water per day, a demand that this project, which has a lifespan of over 20 years, will meet,” said Maduna, adding that his organisation would also train residents on how to manage the scheme.